Home » IMPACT OF CHRONOMODULATED RADIOTHERAPY ON ACUTE SKIN TOXICITY IN CHEST WALL IRRADIATED BREAST CANCER PATIENTS – A SINGLE INSTITUTION ANALYSIS. IMPACT OF CHRONOMODULATED RADIOTHERAPY ON ACUTE SKIN TOXICITY IN CHEST WALL IRRADIATED BREAST CANCER PATIENTS – A SINGLE INSTITUTION ANALYSIS. Department of Radiotherapy and Oncology, Government Medical College, Thiruvananthapuram, Kerala. Abstract: We explored the possible association between the timing of delivery of radiation and the grade of skin reaction that develops in breast cancer patients receiving chest wall irradiation as adjuvant treatment after modified radical mastectomy. Invasive breast cancer patients, registered during the period of January 2013 - December 2014, who had undergone modified radical mastectomy followed by chest wall irradiation, were eligible for inclusion to the study. All the patients received chest wall external beam radiotherapy (EBRT) to a dose of 50 Gy in 25 fractions, one fraction a day, five days a week, delivered as tangential opposed pair, from a Cobalt 60 teletherapy source. Patients were stratified based on whether they received EBRT in the morning (between 8 am – 11 am) or in the evening between (5 pm – 8 pm). The clinicopathological characteristics of patients in both the arms were relatively well balanced. 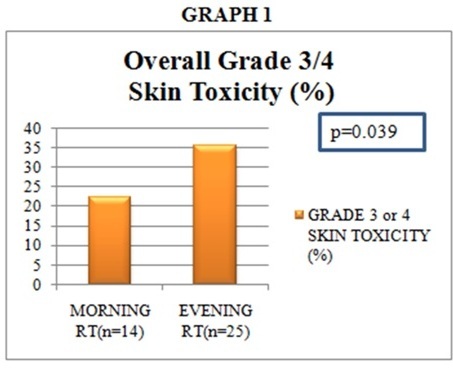 The incidence of higher grade of skin reaction (grade 3 or 4) was 22.5 % compared to 35.7 % in the morning and evening arms respectively, which was statistically significant (p = 0.039). The time to development of Grade 3 or 4 toxicity was 4.44 weeks compared to 4.11 weeks in the morning and evening arms respectively, suggesting that higher toxicity developed earlier in the patients receiving EBRT in the evening, though not statistically significant (p = 0.29). In our department we have three shifts of radiation treatment due to the high patient load and about half of the patients receive radiation either during the morning hours (8am -11am) or during the evening hours (5pm-8pm). We investigated the relation between timing of radiation and the severity of skin toxicity developed as well as the mean time to development of the highest grade of toxicity. In our institution, 436 histopathologically proven breast cancer patients underwent modified radical mastectomy during the period from Jan 2013 to December 2014. Of these, 408 patients received radiation to the chest wall and regional lymphatics. In our retrospective study, we initially included the data of 230 patients who had received EBRT either in the morning (8 to 11 am) or in the evening (5 to 8 pm), for analysis. Later, we excluded patients who had metastatic disease (n=20), interruptions in their planned treatment schedule due to personal issues (n=39) and those with missing information relevant to the study (n=28). Finally, 143 patients were eligible for the data analysis. The study design and protocol was approved by the institutional review board and ethical committee. All 143 patients had received chest wall irradiation using tangential opposed field technique, to a dose of 50 Gy in 25 fractions, one fraction a day, five days a week, for five weeks. Radiation was delivered by a Cobalt 60 teletherapy machine. The field borders used was as follows; superiorly the head of the clavicle, inferiorly 2 cm below the contralateral inframammary fold, medially the midline and laterally the midaxillary line. All the patients received radiation to the supraclavicular fossa to the same dose as per the above mentioned schedule. All patients who had undergone radiation treatment were followed up on a weekly basis to observe for development of radiation induced skin reactions, as per our institutional protocol. The acute skin toxicity was reported and graded according to the Radiation Therapy Oncology Group (RTOG) criteria. Highest grade toxicity/ reaction over the period of treatment and time to develop skin reaction were noted. All these data were taken from the master file of the enrolled patients for the purpose of the study. All statistical analysis were done using SPSS software version 18.0 and the variables were analyzed using descriptive analysis method. Comparison of acute skin toxicity between the groups was done using independent t-test or Chi square test whichever was applicable. p-value of <0.05 was considered significant. Of the 143 patients eligible for analysis, 49.6 % received radiation in the morning EBRT arm (n= 71) and 50.4% patients in the evening EBRT arm (n=72). The pretreatment characteristics were balanced between the two treatment arms (Table 1). Mean age was 50.3 years and 50.52 years for the morning arm and the evening arm respectively. All patients received chemotherapy either as neoadjuvant or adjuvant therapy. While 86.7 % of the patients (n=124) received adjuvant endocrine therapy, 21.6% (n=31) received biological therapy with Trastuzumab. RT in the evening hours (Graph 1, Table 2). On multivariate analysis, there was no pathological variable responsible for the increased propensity for severe skin reactions in the evening RT arm. But, interestingly in the small subset of triple negative patients (n=16) there was an increase in the frequency of severe toxicity compared to the other receptor positive population. 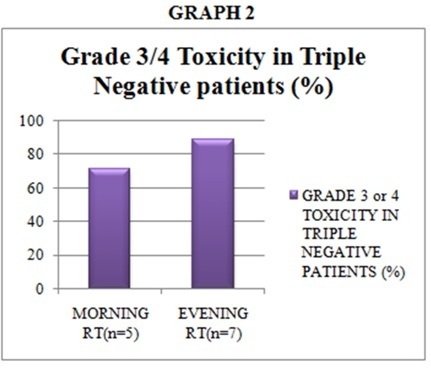 This higher rate of Grade 3/ 4 toxicity with triple negative patients was seen in both the arms, with 5 out of 7 patients (71.4%) in the morning arm and 8 out of 9 (88.9%) in the evening arm (Graph 2). One triple negative patient in the evening arm had to undergo treatment interruption after 21 fractions due to Grade 4 skin reaction in the form of hemorrhage. She recovered with supportive care and completed her radiation treatment (Table 3). 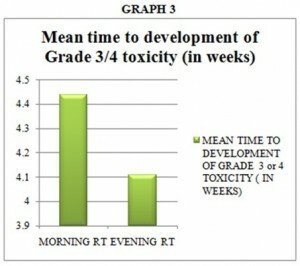 The mean time to development of the highest grade of toxicity was shorter in the evening arm (4.11 weeks) compared to the morning RT arm (4.44 weeks) (p=0.29) (Table 2, Graph 3). We found no difference in degree of development of skin reactions correlating to whether the patient had received neoadjuvant or adjuvant chemotherapy (Table 4). In the present study, we assessed whether there is any difference in the incidence of higher grade of skin toxicity with respect to the timing of delivery of radiation. 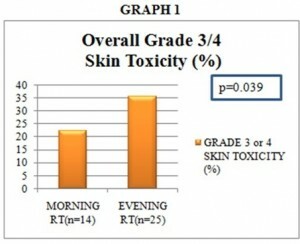 The total incidence of Grade 3 or 4 skin reaction in total was 28.6 %. This value was in correspondence with the results of other published randomized trials that compared standard tangential techniques with newer modalities like intensity modulated radiation therapy.10 With regards to the two arms, the morning RT arm head a significantly lower incidence of Grade 3 or 4 acute skin reactions. In the subset of triple negative patients , the higher incidence of severe skin toxicity irrespective of the treatment time might probably due to the deficient DNA repair mechanism, related to the increased chance of harboring a BRCA mutation. Increase in radiosensitivity with BRCA mutation has been earlier observed. 12-13 This concept needs to be studied in greater detail to be validated. There is definite and ample clinical evidence exploring the beneficial effect of chronomodulated radiotherapy in terms of decreasing normal tissue toxicity as well as improving therapeutic efficacy. But this phenomenon is yet to be implemented into routine clinical practice. Our study, though retrospective, has brought to light the beneficial effects of morning radiotherapy in decreasing radiation induced skin toxicity. Till other novel approaches for skin toxicity reduction come into existence, the concept of circadian variation and the beneficial effect of morning radiotherapy may be utilized. This is cost effective, simple and feasible beyond doubts. Ferlay J, Soerjomataram I, Ervik M, et al (2013). GLOBOCAN 2012 v 1.0, Cancer incidence and Mortality Worldwide: IARC Cancer Base No.11[Internet]. Lyon, France: International Agency for Research on Cancer, 2013. Available from http: //globocan, iarc.fr. Noh, Choi , Park, Hou ,et al (2014), Comparison of acute skin reaction following morning versus late afternoon radiotherapy in patients with breast cancer who have undergone curative surgical resection Journal of Radiation Research, 2014, 55, 553–558 doi: 10.1093/jrr/rrt141. Levi F. Circadian chronotherapy for human cancers. Lancet Oncol 2001;2:307–15. Reppert SM, Weaver DR. Molecular analysis of mammalian circadian rhythms. Annu Rev Physiol 2001; 63:647–76. Reppert SM, Weaver DR. Coordination of circadian timing in mammals. Nature 2002; 418:935–41. Bjarnason GA, Jordan RC, Sothern RB. Circadian variation in the expression of cell-cycle proteins in human oral epithelium. Am J Pathol 1999; 154:613–22. Verma Y, Chauhan AK, Singh H, Sabharwal R, Bharti M and Kaur P: Chronomodulated chemotherapy and concomitant radiotherapy, for the management of locally advanced, head and neck squamous cell carcinom a. Int J Pharm Sci Res. 2014; 5(3):1015-22. Pignol JP, Olivotto I, Rakovitch E et al. A multicenter randomized trial of breast intensity-modulated radiation therapy to reduce acute radiation dermatitis. J Clin Oncol 2008; 26:2085–92. Sinclair WK, Morton RA. X-ray sensitivity during the cell generation cycle of cultured Chinese hamster cells. Radiat Res. 1966; 29:450-74. Ernestos B, Nikolaos P, Koulis G et al. Increased chromosomal radiosensitivity in women BRCA1/BRCA2 mutations assessed with the G2 assay. Int J Radiat Oncol Biol Phys 2010; 76:1199–205. Park H, Choi DH, Noh JM et al. Acute skin toxicity in Korean breast cancer patients carrying BRCA mutations. Int J Radiat Chronological effect of RT in breast cancer 557Biol,2013;doi:10.3109/09553002.2013.835504. Chauhan A, Verma et al. Cancer chronotherapy: the right time to hit! OncoExpert, 2015, Vol. 1(1): 1-7. Bjarnason GA, Mackenzie RG, Nabid A et al. Comparison of toxicity associated with early morning versus late afternoon radiotherapy in patients with head-and-neck cancer: a prospective randomized trial of the National Cancer Institute of Canada Clinical Trials Group (HN3). Int J Radiat Oncol Biol Phys2009; 73:166–72. Irfan B, Kundan S.C, Anil T, et al. Prospective Study Evaluating Impact of Morning versus Evening Radiotherapy on Mucositis in Patients Undergoing Head and Neck Intensity Modulated Radiotherapy with Concurrent Chemotherapy. Shukla P, Gupta D, Bisht SS, et al. Circadian variation in radiation-induced intestinal mucositis in patients with cervical carcinoma.Cancer. Apr 15, 2010; 116(8):2031-35. Innominato PF, Giacchetti S, Moreau T et al. Prediction of survival by neutropenia according to delivery schedule of oxaliplatin-5-Fluorouracil-leucovorin for metastatic colorectal cancer in a randomized international trial (EORTC 05963). Chronobiol Int 2011; 28:586–600. Coudert B, Focan C, Genet D et al. A randomized multicenter study of optimal circadian time of vinorelbine combined with chronomodulated 5-fluorouracil in pretreated metastatic breast cancer patients: EORTC trial 05971. Chronobiol Int 2008; 25:680–96.